Sitting down to watch Home, I’m Darling at the Duke of York’s Theatre, you could almost make the mistake that you’re stepping into a repurposed Mad Men set. 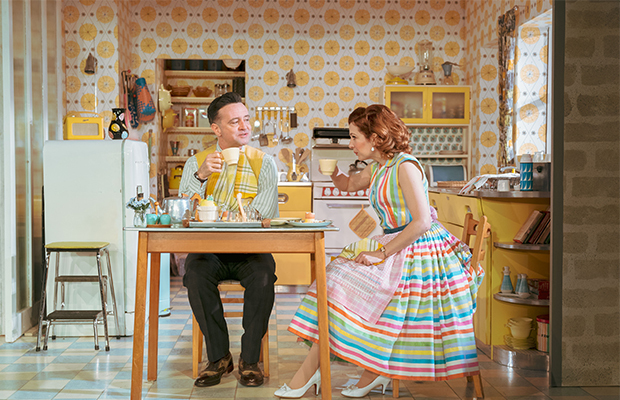 The stage is transformed into a perfectly suburban mid-century modern home, and Katherine Parkinson spins around in beautiful frocks. In this new play by Laura Wade, she becomes a retro-wannabe housewife with enough time on her hands to even polish her cutlery. “We don’t have anything at all that isn’t from the 1950s!” she delights. It’s a beautiful lifestyle that we’ve all fantasised about during a busy commute. And our immediate instinct? This won’t last. Laura Wade’s work, which comes to London via the Welsh theatre company Theatr Clwyd, is laced with a multitude of messages. There is Judy (Katherine Parkinson), whose thirst for perfection and authenticity as well as apparent daddy issues threaten to destroy the picture perfect (35mm analogue, no doubt) nostalgic lifestyle she craves. Both her best friend Fran (Siubhan Harrison) and her husband Johnny (Richard Harrington) instead seem to be struggling with blending modern life and dream world. Then there exists Judy’s mother Sylvia (Susan Brown) and Fran’s husband Marcus (Hywel Morgan), serving a harsh reminder about the reality of the 1950s. Sylvia’s impeccably delivered monologue declares why she fought alongside the second wave feminists to liberate women from the domestic life her daughter glamourises. Sleazy Marcus personifies the sexist attitudes that were abundant back in the 1950s and still sadly persist today. The show’s most unfortunately timely moment was hearing women bemoan how “back then” no one complained about “physical contact” (read: harassment) juxtaposed against Sylvia reminding us how back then, husbands could legally do whatever they wanted to their wives. The thing with this play is there were many timely moments that gave pause for thought. We’re attracted to the aesthetic of the good times, ignoring the ugly bits that rightfully died off with modernisation. We cling to toxic positivity to shy away from problems. There are nods to feminism, naturally, and the question of the material value of housework. We begin to ask what the tolls are, but then the play ends. The topics are almost too broad to reach a satisfying conclusion in two and a half hours. It could be argued, however, that it leaves it up to us as an audience to draw our own conclusions. That doesn’t mean there aren’t some wonderful performances. The play bounces from kitchen sink drama to comedic to dark and back to comedic, it hits an Arthur Miller-esque vibe then swings - almost literally - back to something fiercely modern. The stand out performance come from Susan Brown as Sylvia and set design which, at times, can only be described as witchcraft by Anna Fleischle. This play, although set against a throwback 1950s home, is certainly relevant. Plenty of necessary questions and topics are raised - just don’t expect Home, I’m Darling to give you all the answers.